I bought the TFO 11'6" Soft Hackle rod as a Christmas present for myself with my wife's permission of course. I finally had an opportunity to use it twice this week. Once at Lake Tanneycomo in MO. and this past Saturday at Broken Bow, OK. 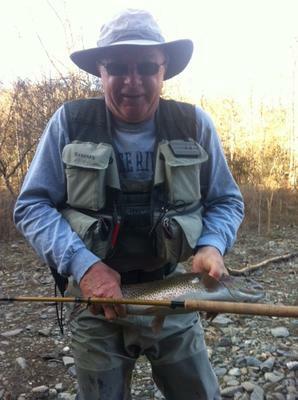 I caught a 12" rainbow at Tanneycomo swinging a size 18 midge. I caught the 18" rainbow pictured at Broken Bow on the spillway creek using a size 16 hybrid prince nymph with a tan size 18 zebra midge below it. What a hoot. Not sure which fly hooked the fish because it came out once the fish was in the net. The rod did very well handling this trout. Thanks for the review, been waiting to hear about this rod. What line did you find that you liked with rod? I have been using the Moonlit Fly Fishing furled leaders. I have a Shogun 9' fluorocarbon and the Silver Creek 10.5' monofilament lines. I attach a 4 foot 5x fluorocarbon tippet to the tippet ring. I have also attached a small "indicator" to the furl portion of the mono line. Both cast well.